30 St. Mary Axe is a 40 story building in the St. Mary Axe area of London. It is recognised as one of the more distinctive skyscrapers in the financial district of London and it stands on the former site of the Baltic Exchange building. Its form is so unique, that it has been given the nickname "the Gherkin." The building was designed by famed architect Norman Foster of the Foster and Partners architectural firm. The Foster and Partners firm has worked on such renowned buildings as the renovated Reichstag in Berlin, London City Hall, and Wembley Stadium. They are known for their innovative approach to design that stands out particularly well against the more conservative nature of most of London's buildings. The design of the Gherkin is heavily steeped in energy efficiency and there are a number of building features that enhance its efficiency. There were open shafts built in between each floor that act as ventilation for the building and they require no energy for use. The shafts pull warm air out of the building during the summer and use passive heat from the sun to bring heat into the building during the winter. These open shafts also allow available sunlight to penetrate deep into the building to cut down on light costs. It has been said that 30 St. Mary Axe uses only half of the energy that a similarly-sized tower would use. The beginning of the Gherkin's birth starts in 1992 as an explosion rocked the financial district of London. The Provisional IRA detonated an explosive device near the Baltic Exchange and catastrophically injured the building. The building was torn down and city officials decided to put a larger tower in its place. The Gherkin began as a much larger building that was dubbed the "Millennium Tower" but which failed to materialise. The original design of the building raised fears that it could negatively impact air traffic from Heathrow. There were also concerns that it may interfere with the sight-lines of St. Paul's Dome from certain parts of the city. 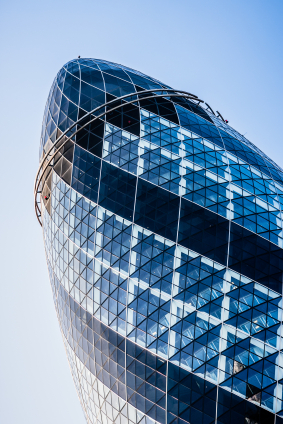 Once the original design was shot down, Norman Foster created the scaled-down version that now sits at 30 St Mary Axe. Construction began in 2001 and the Gherkin was finished in December of 2003. It didn't open for the public until almost half of a year later. Today, the Gherkin is primarily an office building. It is the headquarters of many large companies including Swiss Re and some of the offices of Sky News. Some very popular television shows and radio shows are filmed here or near this building today. The closest London Underground Stations to the Gherkin are Fenchurch Street, Aldgate, Aldgate East, Monument, Tower Hill and Bank.